According to LittleThings.com, the way you and your partner sleep can say a lot about your relationship, “Even if you can’t or don’t articulate those things while you’re awake”, Patti Wood, a body language expert with more than 30 years of experience and author of Success Signals, A Guide to Reading Body Language says. When we are asleep, our body language becomes our tool of expression, and the way we lie and sleep with our partner can gauge how we feel and are in our relationships with our other half. 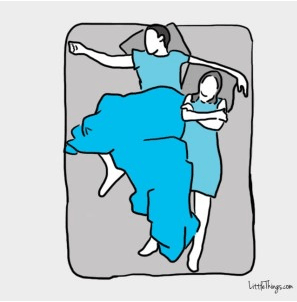 LittleThings.com have revealed the 10 most popular couple sleeping positions and the meaning behind them. This position is only adopted by one fifth of couples and is described as being “a very vulnerable position that’s sexual, but says ‘I trust you’”, where one partner takes a protective stance over the other. This is the position most couple who are past the ‘Honeymoon period’ sleep in, once their relationship matures, saying “I’ve got your back, you can count on me,” but not as sexual as The Spoon. One person is in pursuit of the other. When one moves to the other side of the bed, the other is ‘chasing’ them. Meaning they want to be pursued. This is an intense position, rarer than The Spoon, and tends to happen after love making. It can also be considered as “overly enmeshed” sometimes portraying an over-dependency. This position is an unravelling of the Tangle position. Only 8 per cent of couples adopt this position and it is a sign of a stronger relationship than that of the Tangle, as it is a compromise between intimacy and independence. 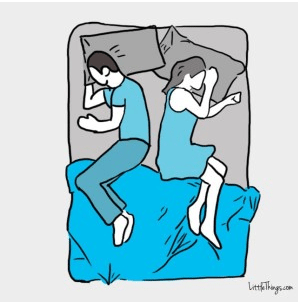 Despite sleeping facing away from each other, this position is a good sign for your relationship. 27 per cent of couples adopt this position and it is a sign of closeness, independence and a security in the relationship. Sleeping back to back with bums or backs touching is also a good sign. More common among couple who have been together under a year, the position shows partners who are relaxed and comfortable with each other. This position is mostly seen in early relationships, or relationships that have been rekindled. This position portrays a strong level of trust and comradeship and is a position that suggest protection. This sleeping position suggests and intertwining of two lives. Intertwined legs can also mean one partner craves a sexual or emotional connection and is also a sign you can’t get enough of each other. If one partner hogs all the room in the bed, it can be a sign of selfishness or one partner being more dominant. 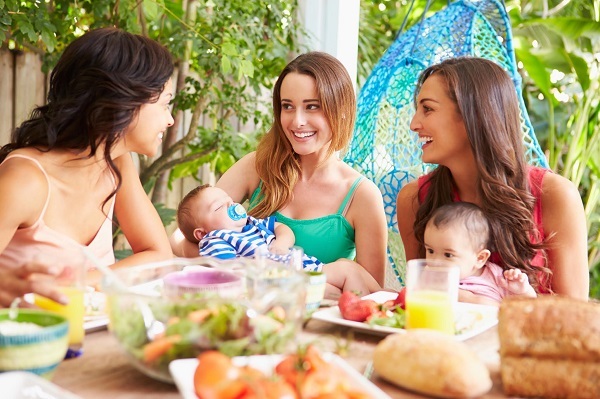 What should I know before I make ‘mum friends’? Beach games for all the family!